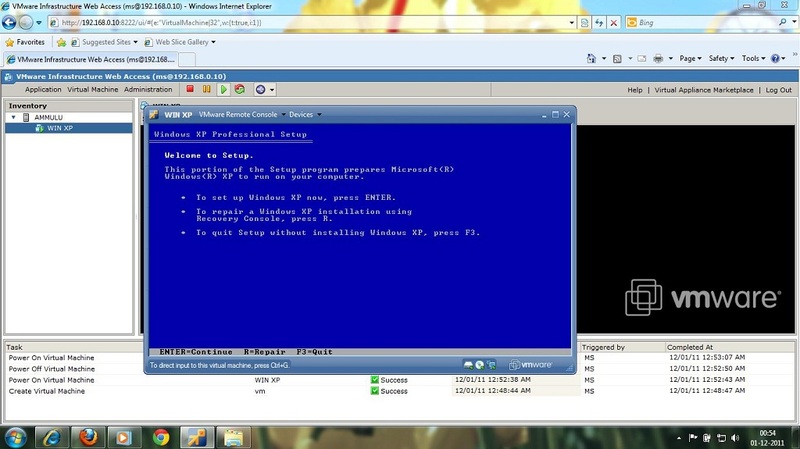 From the my last post installation of VMware Server on Windows 2008 /2003 Server. 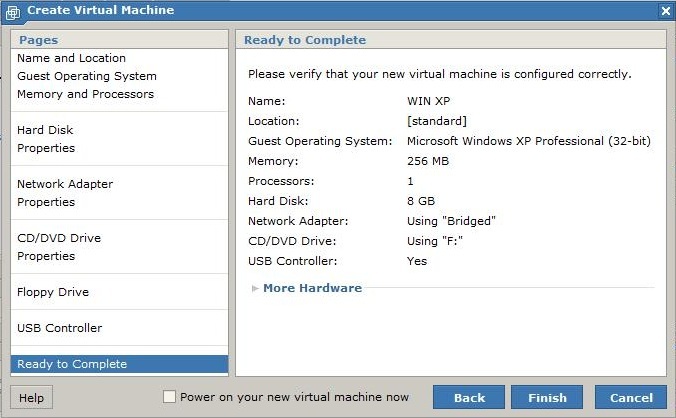 Here i will explain how to install your first virtual machine and how to manage the virtual machine.For the testing installation i used Win XP. 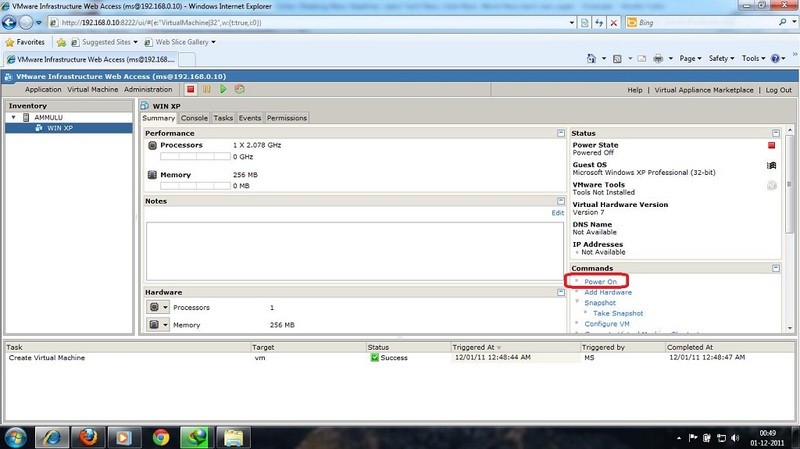 Step 1: Log in to your web console of your VMware server. As per my last post URL will like http://192.168.0.10:82222. 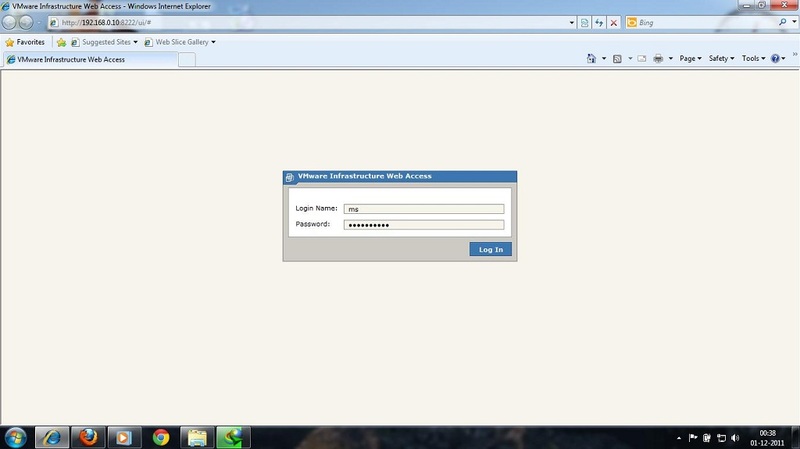 Step 2: Once logged in you will get the main screen of the VMware server web access page. 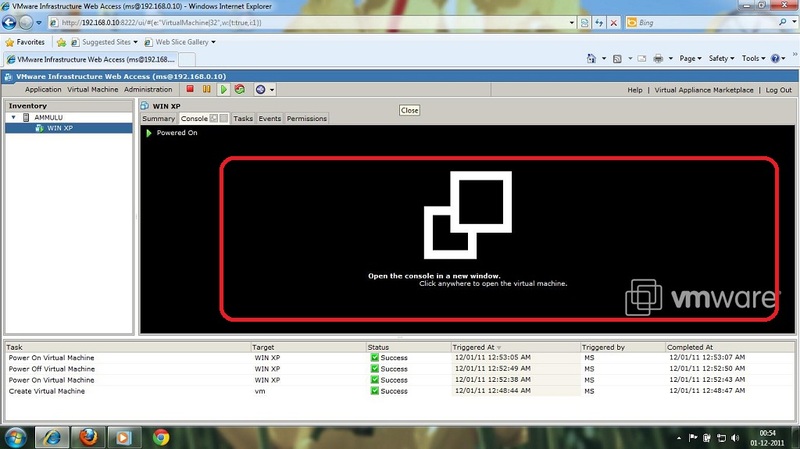 in the Right pane you will find the Create the Virtual Machine. Click on that to start the VM creation. Step 3: New window will pop up and asks you for typing the name for Virtual Machine. Step 4: In the Next window select your operating system that you want to install, then click Next to continue. 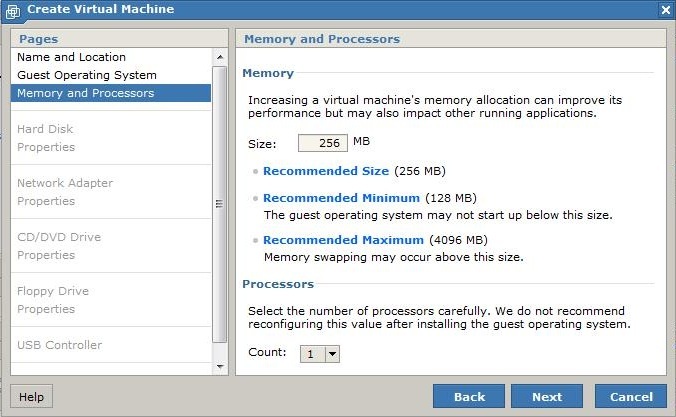 Step 5: Type the amount of RAM that you want assign for the VM, then clik Next. 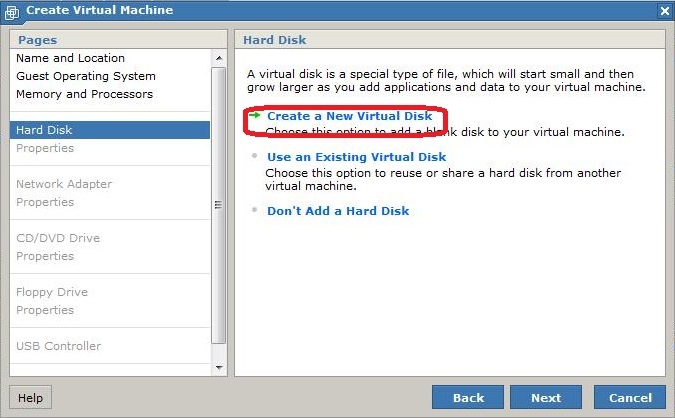 Step 6: Select whether you want to create the New Virtual Hard Disk or Use it from Existing. In our case you are installing for first time, so click on Create New Virtual Hard Disk. Step 7: Assign the amount of HDD space then click Next. 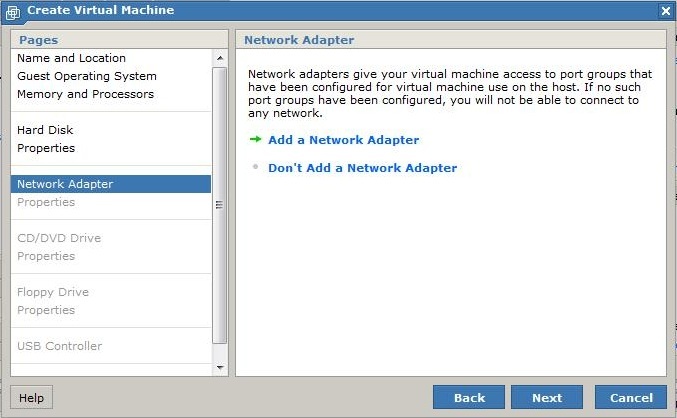 Step 8: Click Next on the Network Adapter window because the default option is to add the network adapter. Step 9: Select connection type from the drop down menu. 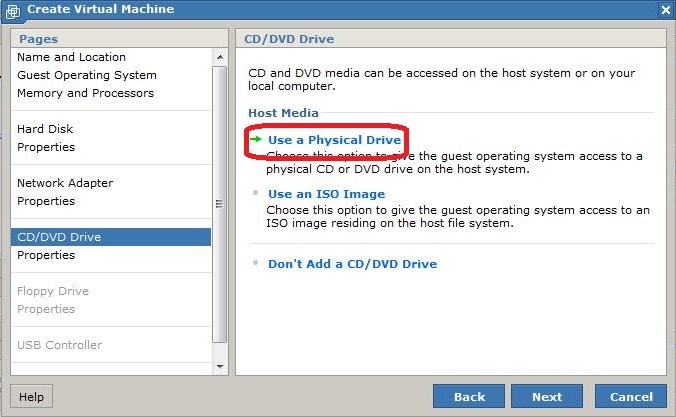 Step 10: Next is the CD/DVD Drive Setup page. Here you have to take care of selecting option. 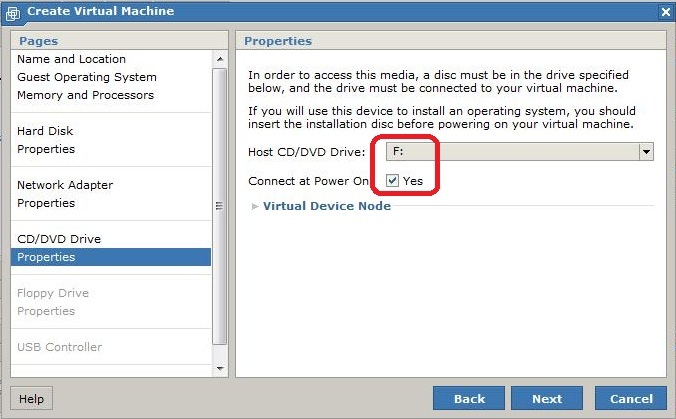 if you are installing from CD/DVD ROM, select first option. You will get the following windows, select the CD/DVD Drive from the drop down menu. 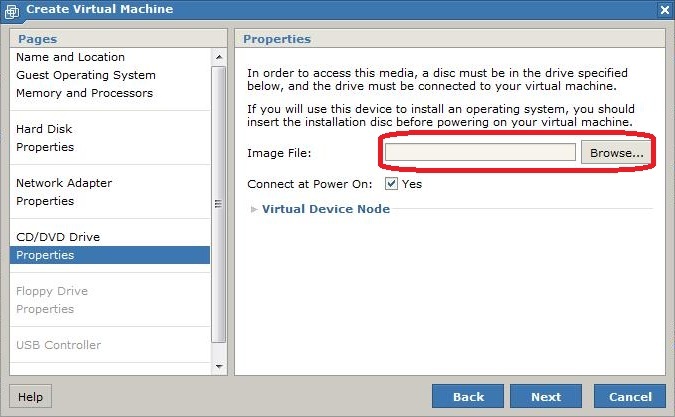 Take a look here you have to put CD/DVD ROM on the Machine where your VMware server installed not on where you are managing. If you you want to use ISO image instead of the CD/DVD ROM, you need to put ISO image on the datastores. 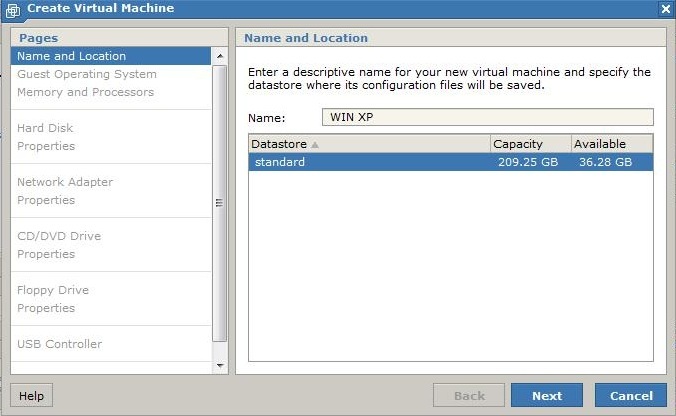 Datastores is nothing but Virtual Machine Storage location that you have selected during the installation of VMware server. in most of the case default location is “D:\Virtual Machines\” unless you haven’t changed, place your ISO image in the “D:\Virtual Machines\”. Once put, Browse for the ISO image through the VM creation window. 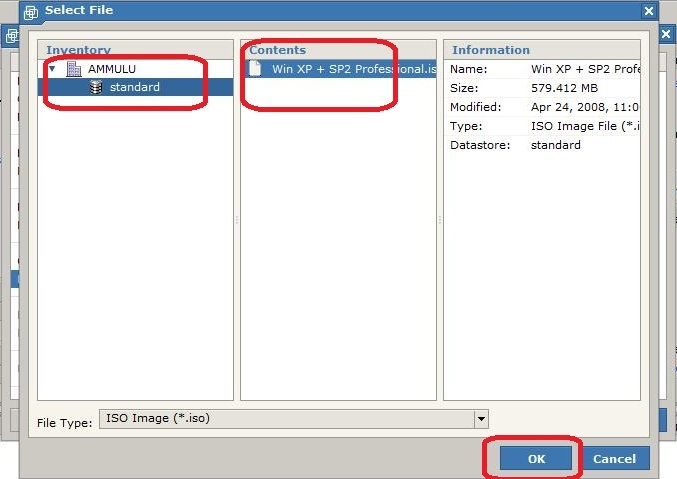 Select the ISO image and click OK. 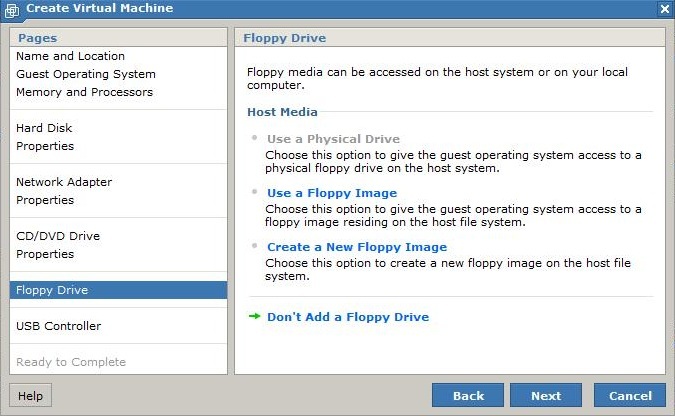 Step 11: Next is the Floppy Selection window. I don’t required it. Step 12: Click Next on the USB Controller window. Step 13: Click Finish to close. 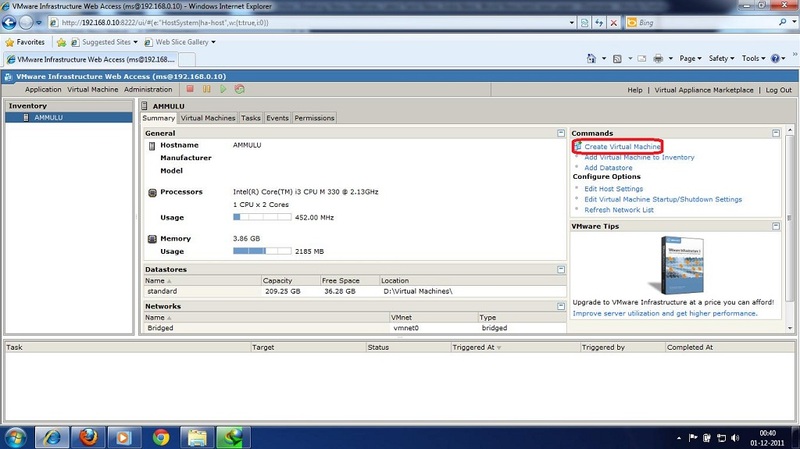 Above the Finish button you will find the Summary of your Virtual Machine. 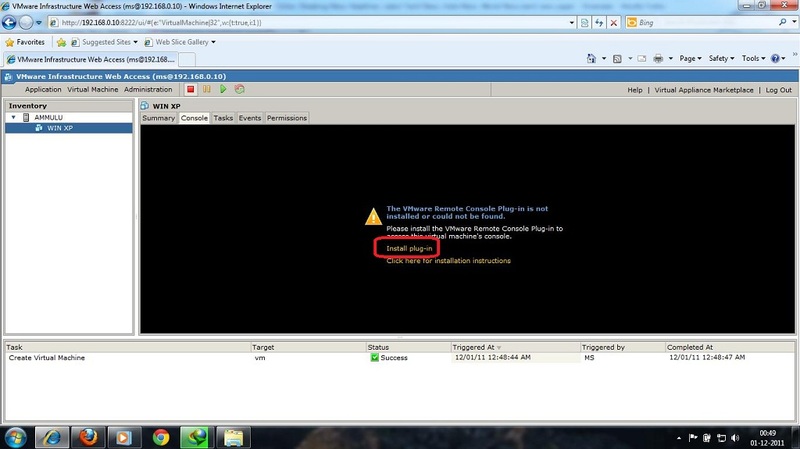 Step 14: In the left pane you will find the newly created the Win XP VM. 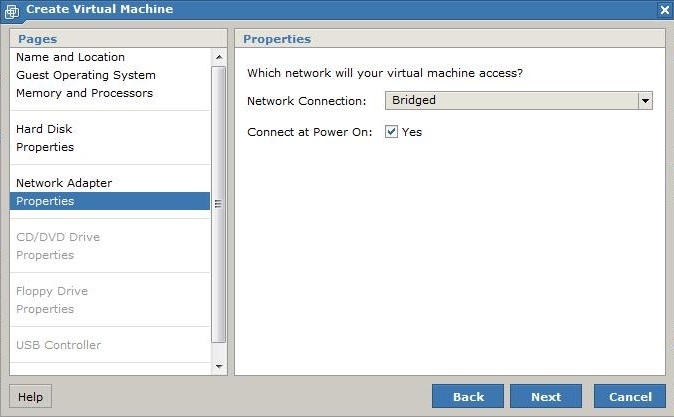 in the right pane you have option to Manage the manage it, like power on, add hardware, take snapshot and so on.. Click on Power ON. 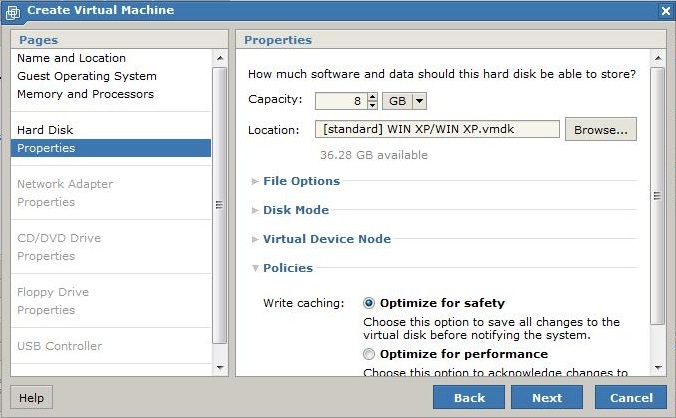 Step 15: Click on the console option of WIN XP VM. for the first you need to install the Remote console plugin. Click on install plugin. Once downloaded, install it. Before installing close the Internet Explorer. Step 16: Once installed, open IE you will get the golden bar on the top saying that to Run add-on. Right click on that bar and Select the Run Add-on All website. Step 17: Click Run on the security warning window. 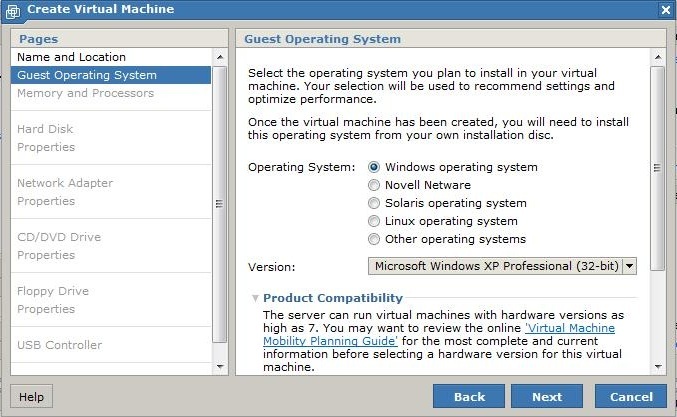 Step 18: Now you will get the following console option on the WIN XP VM. click anywhere on the console. Step 19: You will get the console on the New Window. The Windows XP setup will begin. That’s all!. 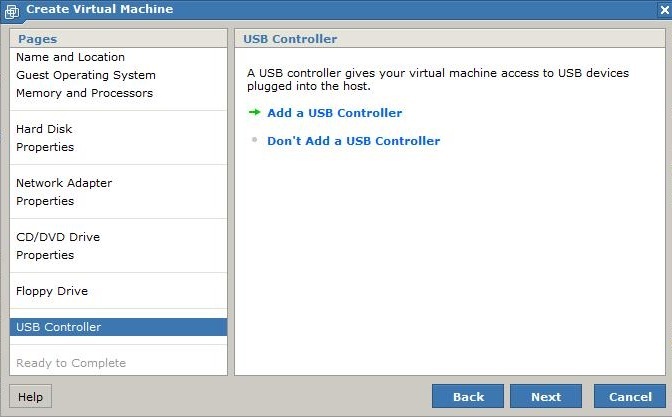 This way you can install all the Guest OS that are supported by VMware Server.